‘Stop taking photographs of this, go to a museum,’ he mutters as he walks past me. 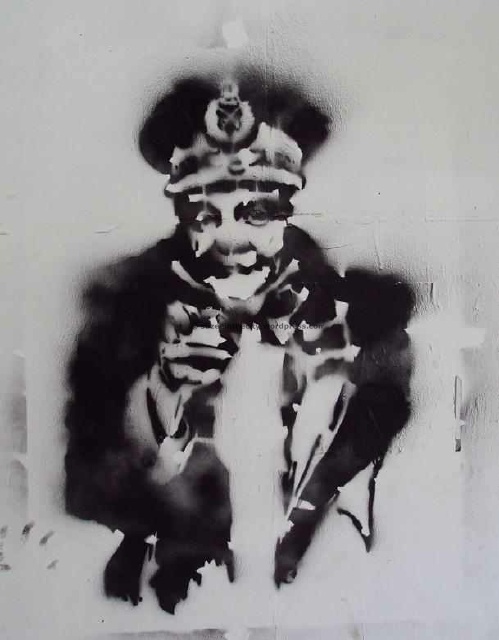 I’m standing in front of the American University in Cairo’s library wall, photographing a graffiti piece depicting video game characters Ryu and Mr. Bison, the latter wearing a Tantawi face that has been neatly slashed with red paint. I look at his dark, unwashed face. Six months ago, I would have ignored his comments as the usual banter I get from a street kid trying to hawk tissue papers or spew rough, crude sexual commentary. Yes, I’m quick to judge like that; but so are you. 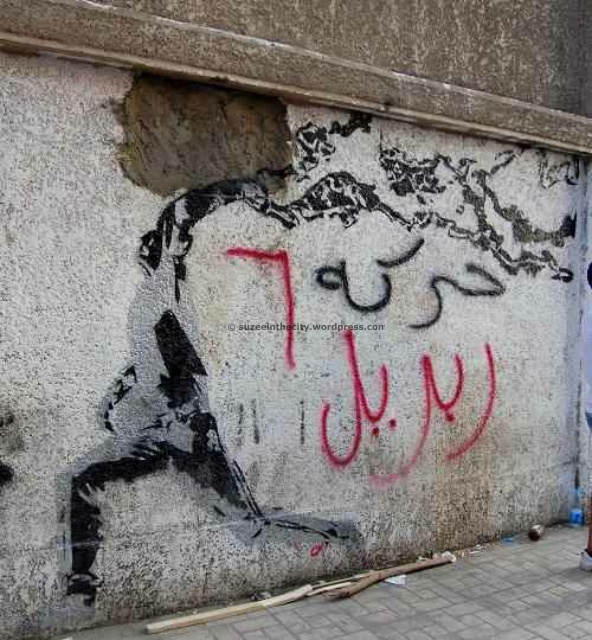 Things have changed, and I understand now that Mohamed Mahmoud Street is his as much as it is mine. The loud microphones from the packed Tahrir square echo onto the dirty street haunted by a few kids nonchalantly playing football. They laugh a few steps away from thousands of people yelling, screaming, sitting, arguing and demanding their democratic rights. Life moves on in Cairo in such a curious, casual way. ‘What’s wrong with me taking photographs of this?’ I ask him politely. Suddenly shy, he stammers, ‘It’s nice but you should be taking photographs of the museum,’ he gestures behind him in the general direction of the Egyptian Museum, one of Cairo’s biggest tourist attractions and former headquarters for the Supreme Council of Armed Forces’ torture practices and virginity testing of Tahrir protesters. I understand; museums need tourists, I carry a camera; therefore I must be a tourist. Instead of helping my country’s economy by channeling cash into the tourism industry, I’m out here snapping away giddily at obscure doodles on a once-clean wall. 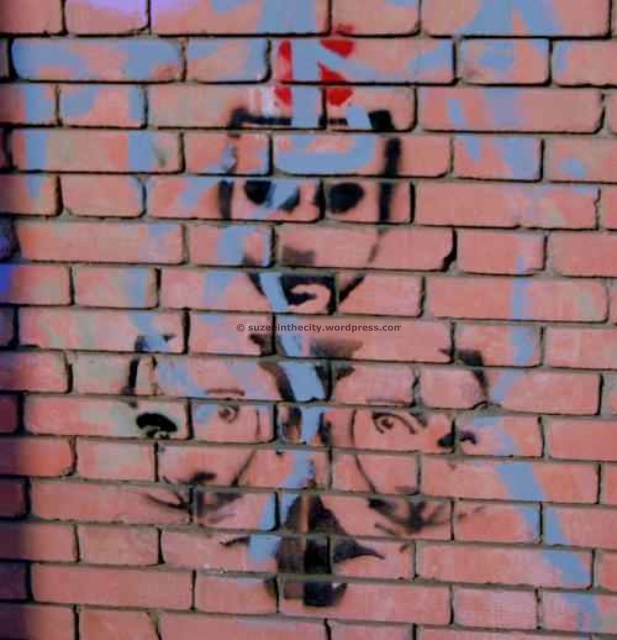 He shrugs and stares at the graffiti with a frown. He may have never played a video game in his life or watched any of the Street Fighter cartoons, he was probably part of Egypt’s booming child labour force while cushy comfortable middle-class Egyptians like me sat lazily in front of the TV. This graffiti piece speaks nothing to him. He doesn’t get the message. 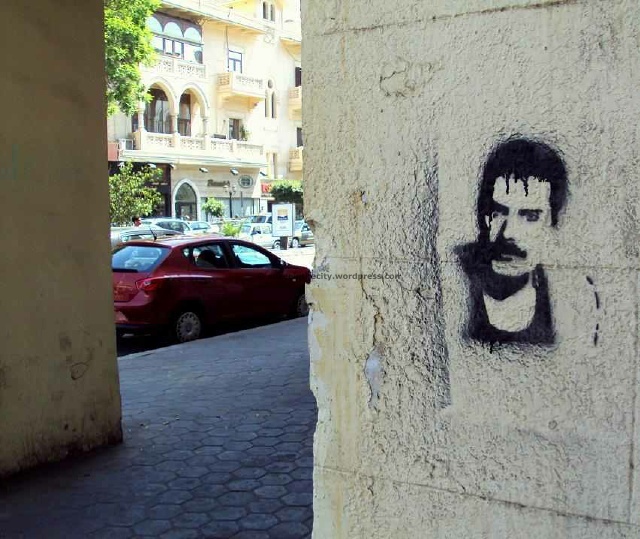 A lot of street art popping up all over Cairo is in English and uses Western pop culture references that only speak to members of a more privileged societal background, while the average Egyptian earning less than two dollars a day is left in the dark. The street is his as much as it is mine, and this art should be for him and speak to him, whether as a call to protest, or as a reaction to an idiot going on TV and complaining about her nephew being unable to eat pizza every night. 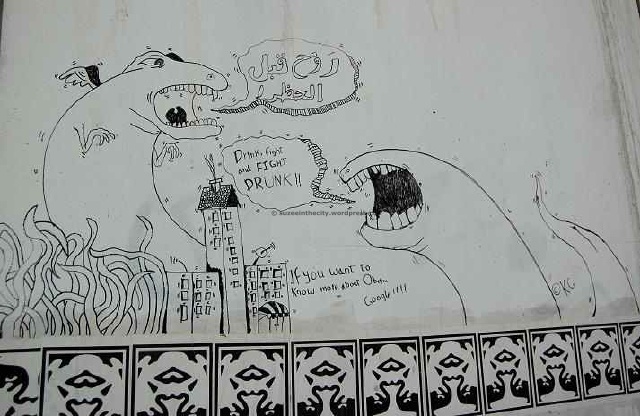 The graffiti I love is pretty, grotesque, heavy in its political messages and easily relatable. It’s on your bus stop, your street corner, obscured under your bridge. It’s out there for the people, but in my humble, unsolicited opinion, it needs to start speaking the right language. 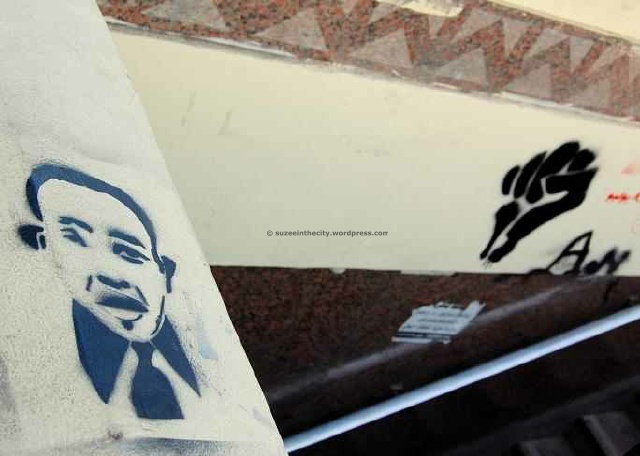 Below is a selection of my favourite graffiti pieces in Cairo, including old stencils in Heliopolis and recent #jul8 stencils in Downtown Cairo. 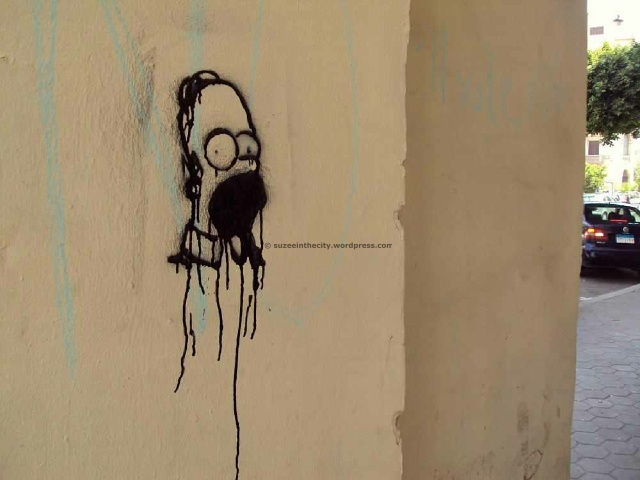 Homer Simpson by Karim Gibril, also painted over in early June 2011. 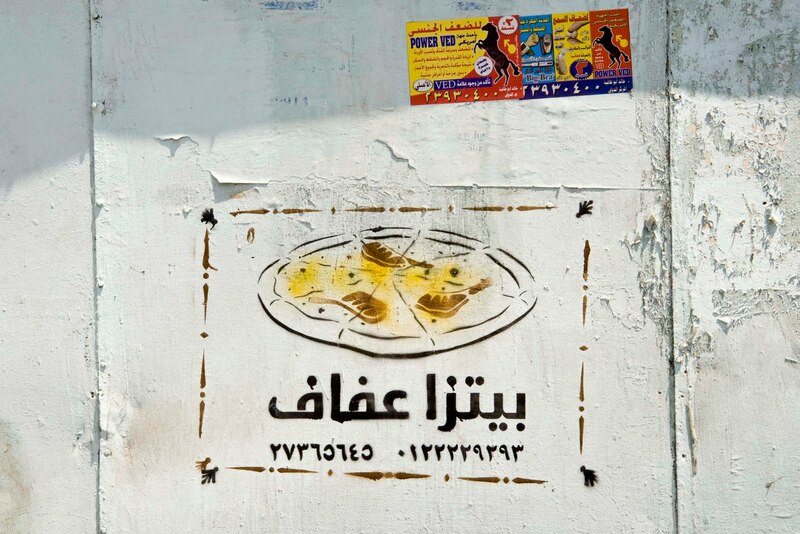 Pizza Affaf graffiti by Adham Bakry in Mostafa Mahmoud Square, a tribute to Affaf Shoeib. Photo courtesy of Adham Bakry. 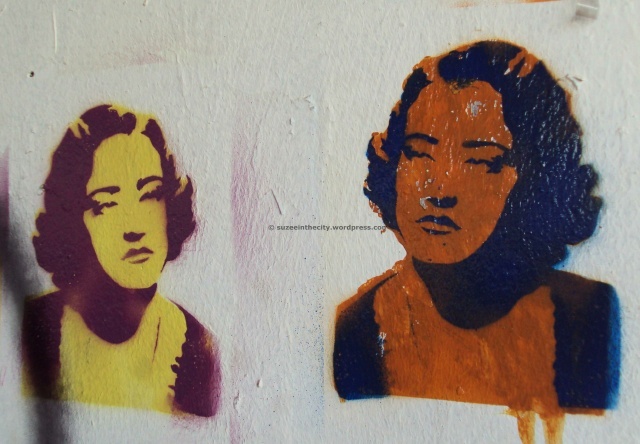 Salvadore Dali appears below the Head graffiti by Chab, which was first spotted in Zamalek. Brain stencil above ‘Zena Fil Betreena’ literally translates to the brain is shop window decoration, meaning people don’t use their brains enough. By Chab. 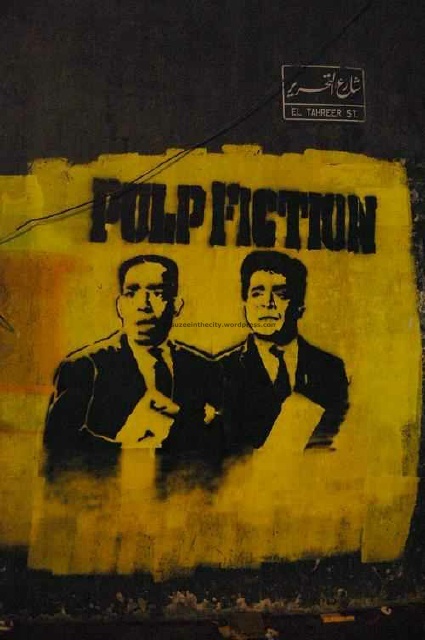 This entry was posted in Street Art Fascination and tagged Adham Bakry, Afaf Shoeib, angel, Bart Simpson, bus stop, Cairo, Curfew, Dictator, Dokhan, graffiti, ismail yaseen, keizer, Korba, Niqab, Pizza, pulp fiction, revolution, Sad Panda, street art, tahrir, video games, Woody Allen. Bookmark the permalink. 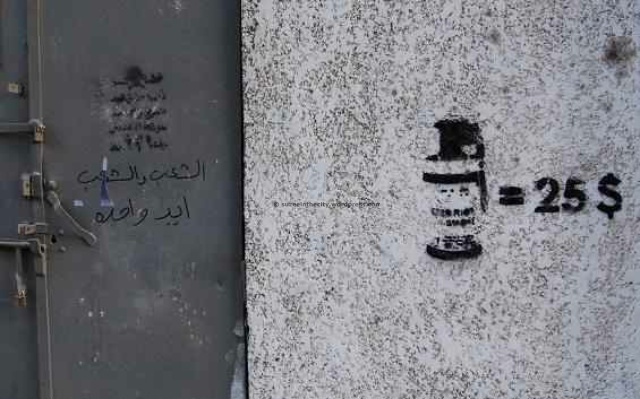 8 Responses to Cairo Graffiti -For Whom Exactly? I think the one Africa/Europe one the protester is throwing back a tear gas canister, but I am not positive on that. I love all interpretations of the “protester carrying flames, throwing back tear gas or whatever..” I heard it is a man carrying the smog away.. 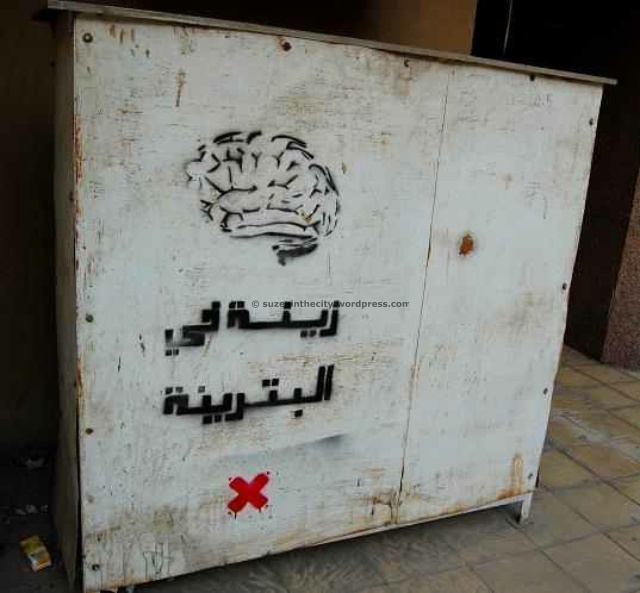 Still, I think it is open to even more ways how to read it, such as some other graffiti and art in general.. There are many ways how and to whom it can speak.. Doesn’t matter what language it speaks, or if it uses references from other cultures.. It s enriching and inspiring both ways..
All of these are wonderful, but bitza Afaf in particular is giving me an unadulterated joy attack…. 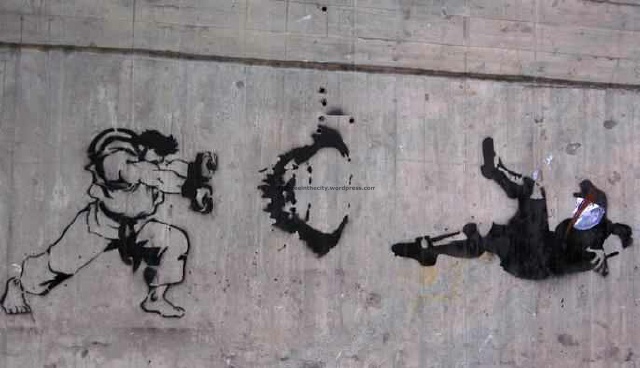 I too suspect the street fighter is throwing back a tear can canister.. 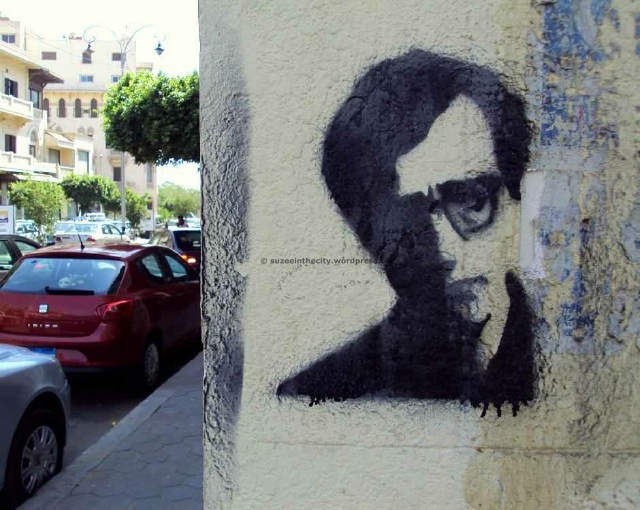 This blog is an awesome collage of Egypt’s recent surge in graffiti expression. Could you please advertise a new Street Project we are tyring to put together. Since We have all these problems with big Media controlling the spread of information and what kind of info gets to the masses, and at the same time we have all these unused streets and walls that can serve as an amazing ALTERNATIVE platform. 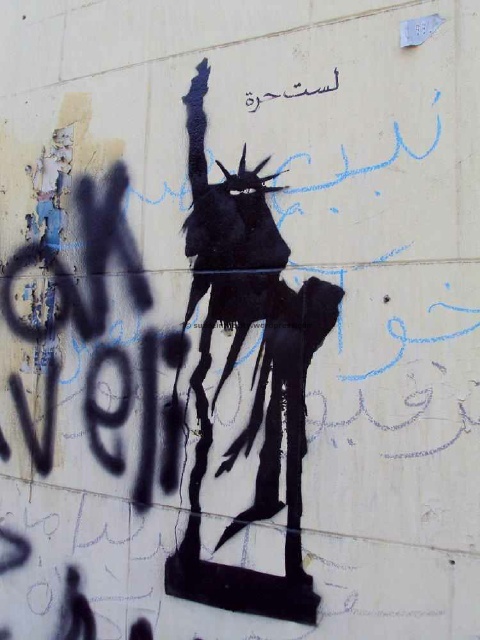 So the idea is simple: use street art to promote public awareness AND social change. We’re having our first creative session this Sunday, August 21, 2011. Plz chk it out our page: https://www.facebook.com/pages/Bringin-Art-Skillz-to-Egypts-Streetz/267106683299507. LIKE the pg, post it on your blog and pass on to ppl you think might be interested in Cairo (i.e. artists specifically). لو عندك موهبة ,عندك حاجة تقولها ,رسالة تنشرهيبقى احنا عايزينكا! اكتبها ,صورها ,شفها ,الزقها،اقلبها ,فجرها! احنا عايزين تغيير ,مش إستقرار و خلاص .عايزين إدراك سياسي و تغييرات إجتماعية.